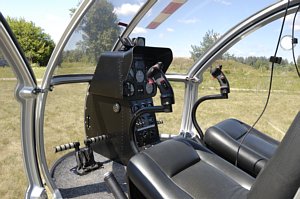 The cabin of the helicopter accomodates two crew members comfortably. 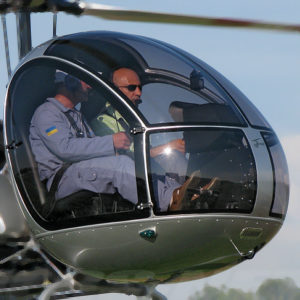 The width of the cabin at shoulder level is 1200 mm (vs. Robinson R.22 - 1055 mm). The large windows provide excellent visability in all directions. No t-bar here! Conventional easy detachable dual cyclic controls provide the ultimate feel and control. The AK 1-3 is equipped with a heating and ventilation system that allows flight in winter. The AK 1-3 power-plant is a 156 hp, fuel injected, Subaru EJ-25. It is liquid cooled and was chosen for it's reliabilty and excellent power to weight ratio. 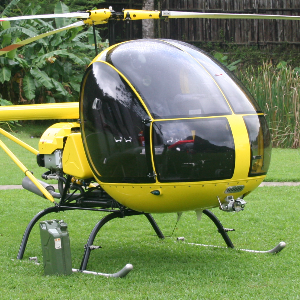 It uses premium (95) avgas fuel.